If you are trying to plan a last minute overnight backpacking trip here during peak season, good luck! I wasn’t able to. Instead, due to ease of planning, I chose to do this as a day hike and camp in a campground nearby. 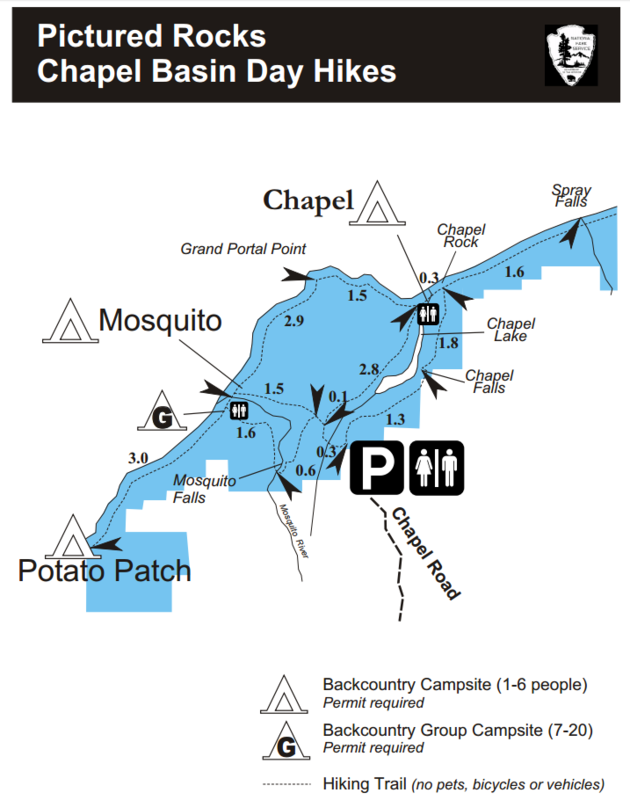 I considered Little Beaver Lake campground due to it’s close proximity to the Chapel trailhead, but it’s not possible to make reservations. It’s first come, first served and there are only 8 campsites. 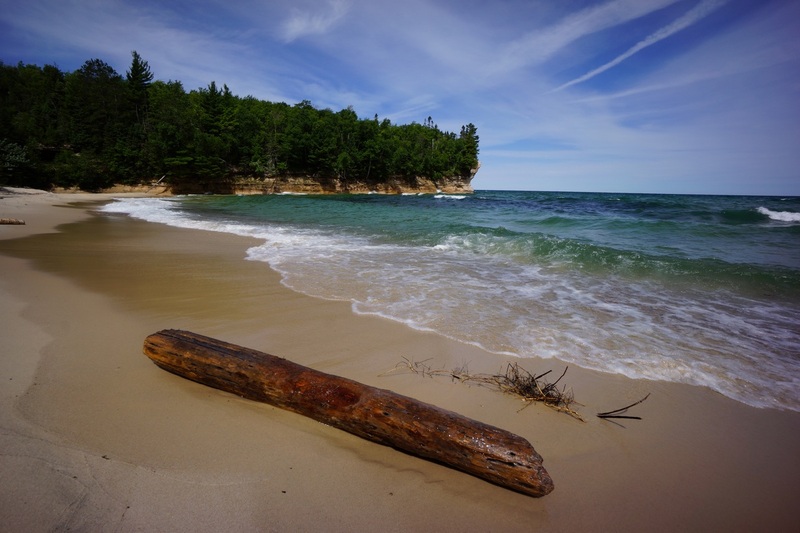 Twelve Mile Beach campground is the same, first come, first served. 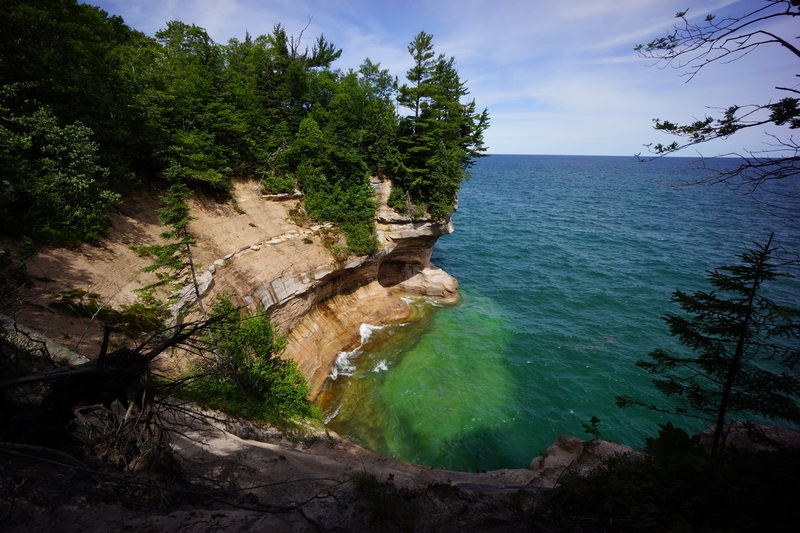 I believe it’s the same for all of the other Pictured Rocks campgrounds, but I didn’t check them all out. Instead, I started looking at nearby state forest campgrounds, and there were several in the area to choose from. No reservations here either, but I figured this would be my best bet at snagging a campsite. I drove up Thursday evening and the Little Beaver Lake campground was full, as I expected. I proceeded to North Gemeni Lake campground which was about 10 minutes away, and found it less than half full. I was lucky to get a campsite on the lake, which had a pretty good view. Chapel trailhead is only about 15 minutes away from the North Gemeni Lake campground, so it will be a short drive in the morning This is just as good as leaving from Little Beaver Lake campground, so camping here really worked out for me. We arrived at the Chapel trailhead around 8:30am. There were 4 other cars in the parking lot. The weather had been extremely hot lately (in the 90s downstate), but today was only forecast to be 60! A pleasant change, and very welcomed considering the number of miles we’d be covering today. The trail starts off as a very wide pathway, an obvious indicator of the heavy traffic this area receives. The trail runs through a fairly open forest alongside a gorge, which is out of sight from here. After about 1.2 miles, the trail swings closer to the edge of the gorge and we get our first glimpse of Chapel Falls. There’s a wooden platform built alongside the trail that gives a pretty good view of the falls, which are about 80 feet high. The falls are formed by Section 34 Creek flowing over the edge of the gorge. I guess “Section 34 Falls” just doesn’t have the same ring to it as Chapel Falls. The trail then crosses Section 34 Creek and continues along the gorge. The trail goes by the top of the waterfall too which is a cool vantage point, but be careful here. At this point we started to see a few more people on the trail. There wasn’t much of interest through the next 1.8 miles or so. 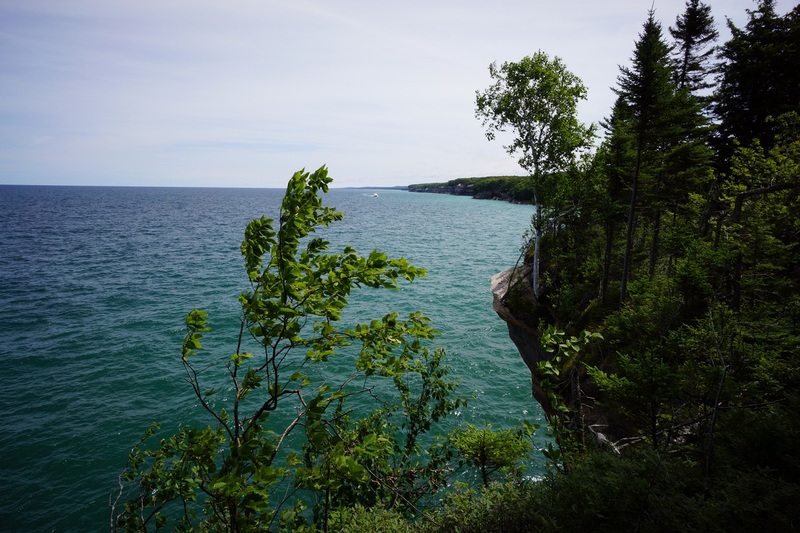 When the trail reaches the shore of Lake Superior, it basically dumps you out right at Chapel Rock. 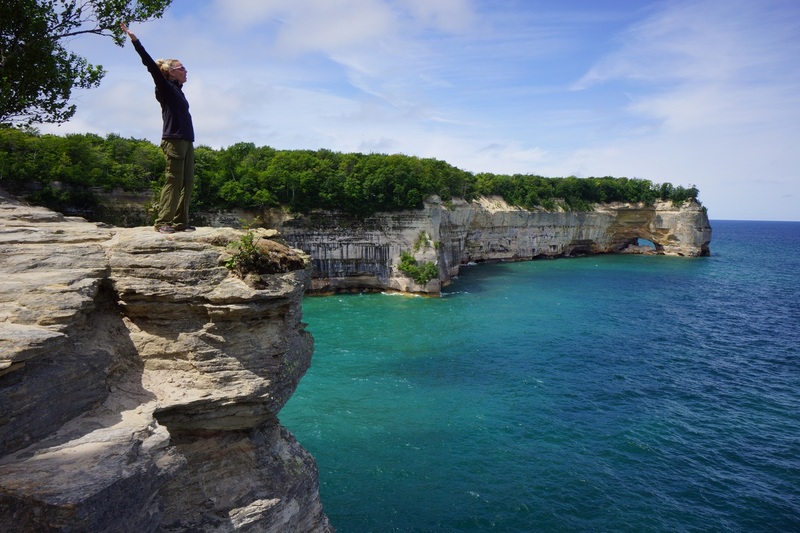 This is one of the major landmarks of Pictured Rocks. The rock here has been eroded away leaving this unique geological feature. What makes it really unique is that there’s a large tree growing out of the top, and it’s roots, which are quite large, are spanning a gap that’s maybe 12 feet. While you can get pretty close to Chapel Rock, it’s fenced off. The best pictures I’ve seen of Chapel Rock are from the water though. The lighting is better and the angle is more optimal. Chapel Beach has some good views of it as well. After leaving Chapel Rock we headed west a very short ways until we crossed a footbridge over Chapel Creek. Alongside the creek is a little footpath that leads down to the beach, or you could just walk further west along the trail to access the beach in numerous other areas. We chose this one though, and followed it a couple yards until it dumped out into Lake Superior. This was a pretty cool sight, seeing the water of the creek flow right into such a huge lake. We took a short break here on Chapel Beach to eat some food and just enjoy the scenery. There were a few more hikers passing through the area but still fairly light in terms of traffic. 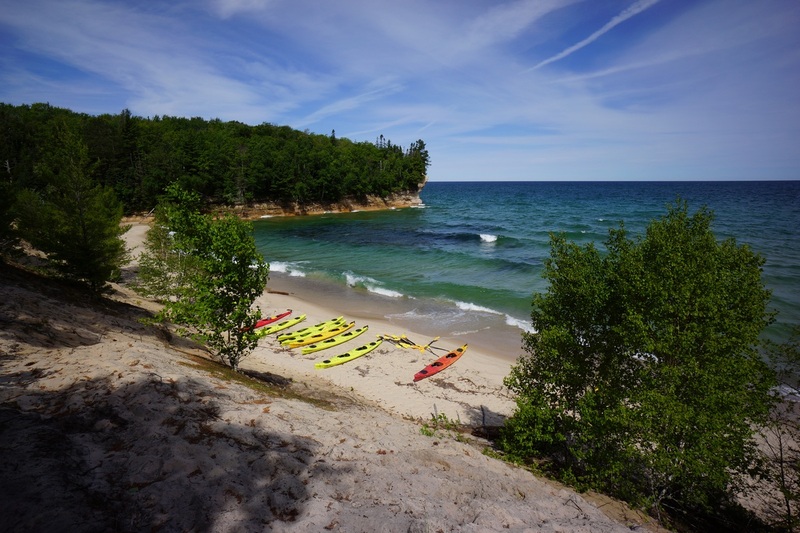 Back on the trail and heading west towards Mosquito Beach, we saw a bunch of Kayaks on the shores of Chapel Beach. The waves looked a little rough today as it was fairly windy, but then again, I imagine Lake Superior is often much rougher. It was last time I was here in June 2011. 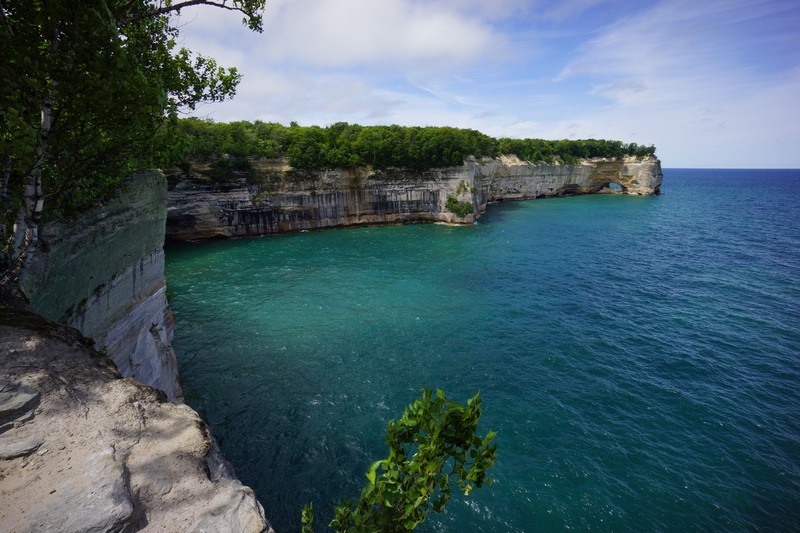 After leaving Chapel Beach behind, the trail heads uphill a short ways and stays close to the edges of the cliffs. To the east, I could see Spray Falls dumping out into Lake Superior. Beyond that, Twelve Mile Beach. 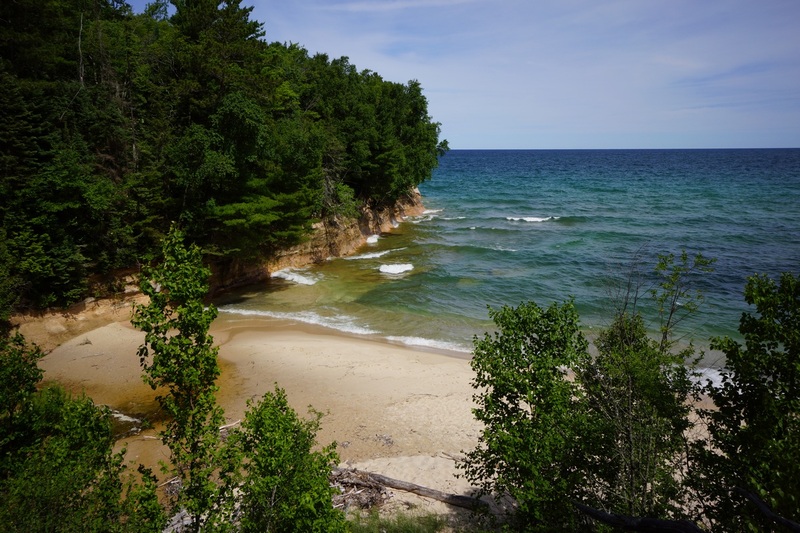 The trail along Lake Superior through Pictured Rocks National Lakeshore is part of the North Country Trail, which, when completed, will be the longest hiking trail in the US at 4600 miles. 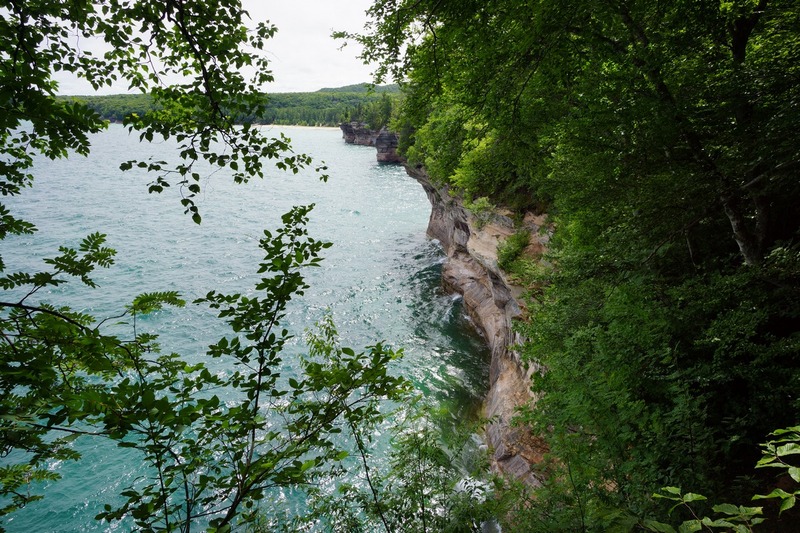 The section that runs through Pictured Rocks is called the Lakeshore trail and runs about 42 miles from Munising to the Grand Sable Visitor Center. 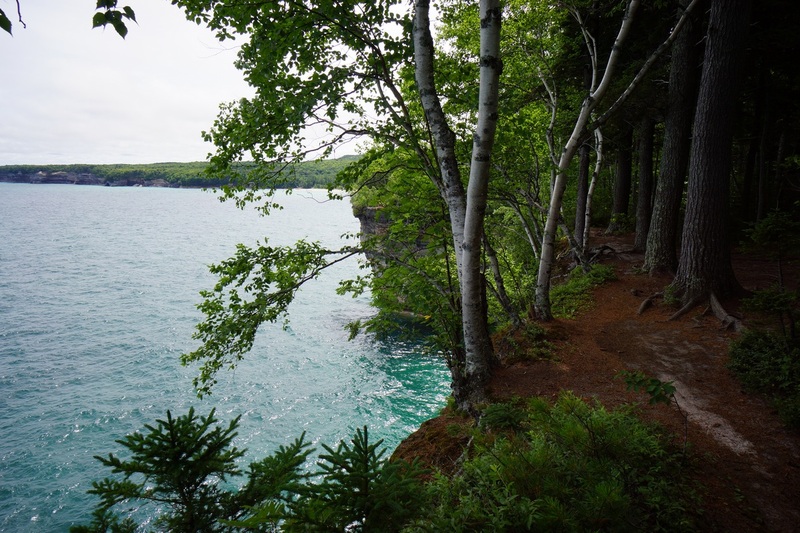 I completed the Pictured Rocks Lakeshore Trail in June 2011, although the weather was terrible. 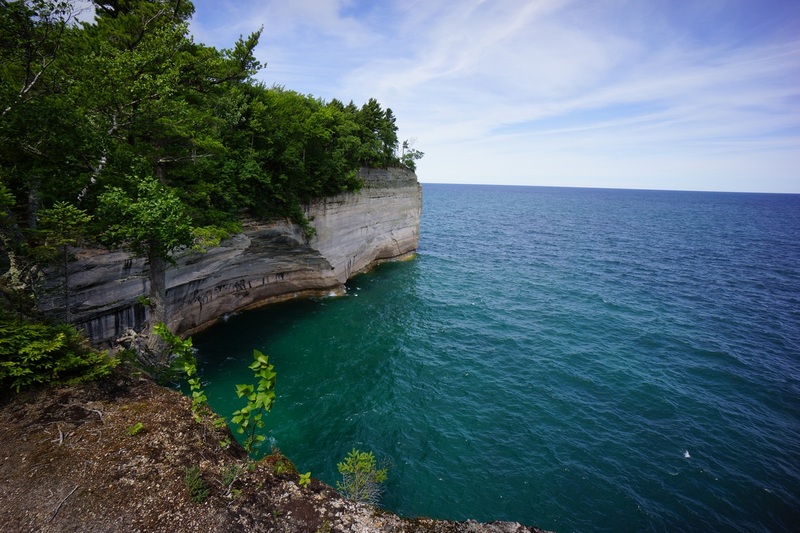 I’m glad to have long distance views like this and finally be able to see the real Pictured Rocks! 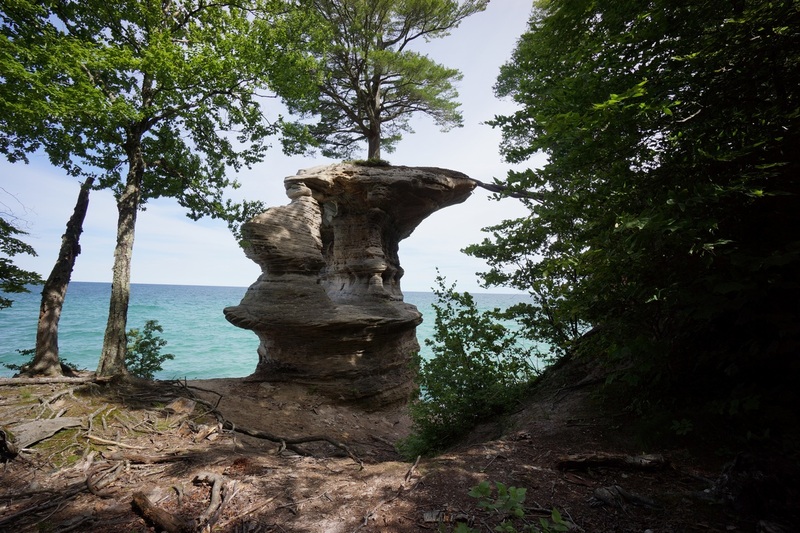 As we continued on the trail, we encountered many interesting rock formations and coves. The color of the water is an awesome blue color, almost tropical looking. Don’t be fooled, that water is cold! The contrast of the blue color and the rocks makes for some pretty appealing photos. It took quite a while to work our way along the trail now as the views were just amazing, and we found ourselves stopping at every new vantage point we came across. There was an increasing number of hikers along the trail now. When we reached the point that’s roughly halfway between Grand Portal Point and Chapel Beach, we took another break. At this point there are several ledges that provide an excellent view of an arch in the rock below Grand Portal Point in the distance. We found this area particularly appealing and decided it was worth an extended stay. These were the best views yet for me. After leaving our break spot, we encountered more stunning views of the same area from different angles. The cliffs on the western side of this cove were pretty cool looking, consisting of different color bands in the rock including a vibrant pink. 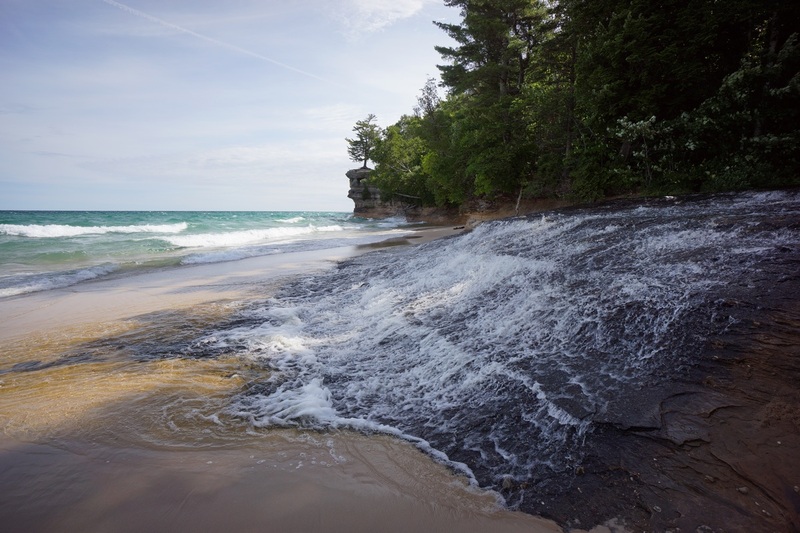 It’s easy to see where this area got the name Pictured Rocks. When we arrived at Grand Portal Point, there wasn’t anyone else around, for the moment anyways. Even though this whole area was obscured in fog during my only other visit here previously, this was one of my favorite spots along the entire Lakeshore Trail. With the clear blue skies today, the same proved to be true. Before I had a chance to take any pictures, the area was swarmed by hoards of hikers passing by in both directions, and you can bet they stopped here. We waited for about 20 minutes as about 30 people made their way through the are before I had a clear shot. It was definitely worth the wait, this area is pretty stunning! After leaving Grand Portal Point, views back to the east continue to please the eye. The trail continues to skirt the edges of the cliffs, but views are mostly obstructed by greenery. However, breaks in the often dense vegetation are numerous. About a half mile hike west of Grand Portal Point we rounded another point. We stopped for a break here as well to soak in the incredible scenery. There were less people passing through this area and it was nice to have this little area to ourselves for a bit. Now past the last major point along today’s hike, the trail drops in elevation a little bit and brings us a little closer to the water. 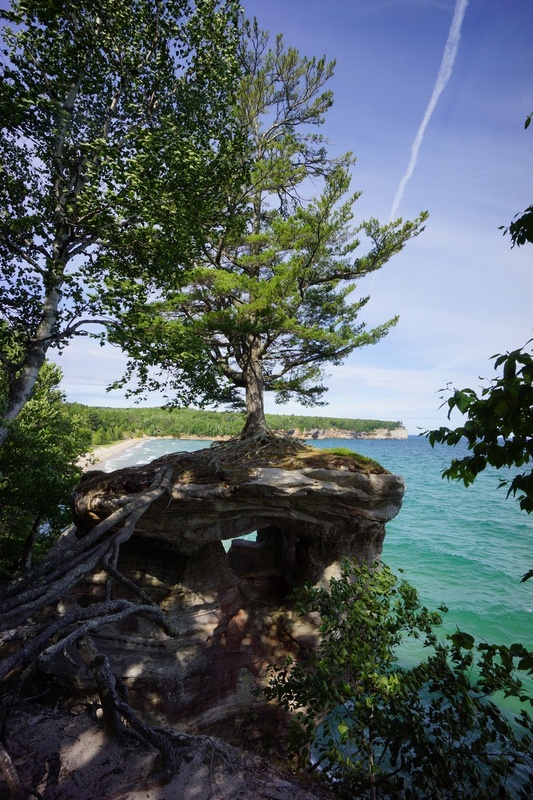 For a brief time, we enjoyed a few more breaks in the trees allowing for more extended views of the shoreline. Eventually though, the vegetation breaks subsided and we found ourselves just covering ground in lieu of the grand views we had been so spoiled by earlier. This persisted much of the way to Mosquito Beach. We made it to Mosquito Beach mid afternoon. We crossed the bridge over Mosquito River and headed down to the beach. The mouth of the river was wider than that of Chapel River, but still shallow enough to walk across if one was so inclined. Here at Mosquito Beach, there were large, round rocks scattered along the shoreline, unlike Chapel Beach. We walked down the shoreline of Mosquito Beach for a while, but eventually route became impassible the ground behind us became steeper and started running into the water. We turned around and headed back to the mouth of Mosquito River. Back at the Mouth, we decided to head back to the car as we had basically seen everything we set out to see for the day. 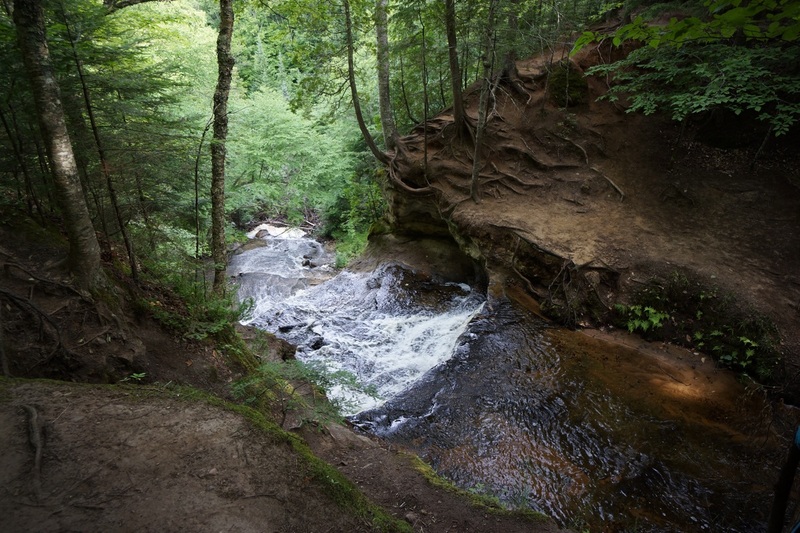 However, we did have one last place to visit, and that’s Mosquito Falls. 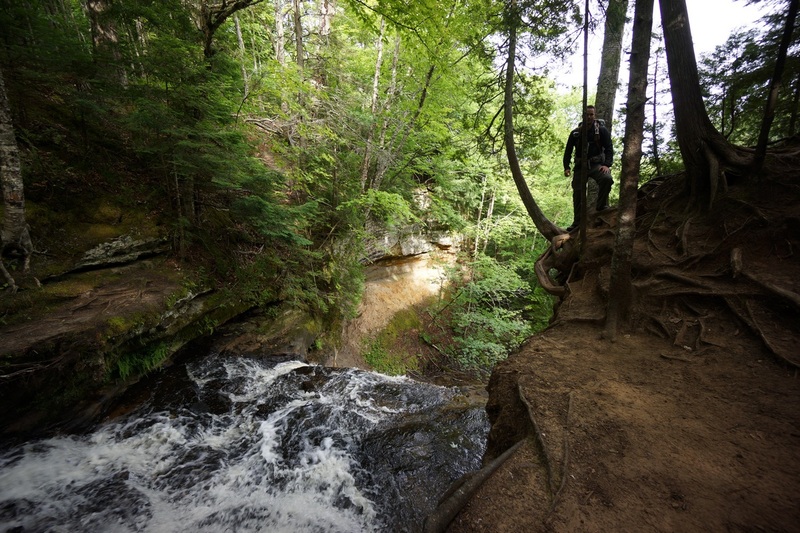 The hike to Mosquito Falls wasn’t particularly amazing after hiking the Lakeshore Trail, but hey, it can’t be incredible all the time right? 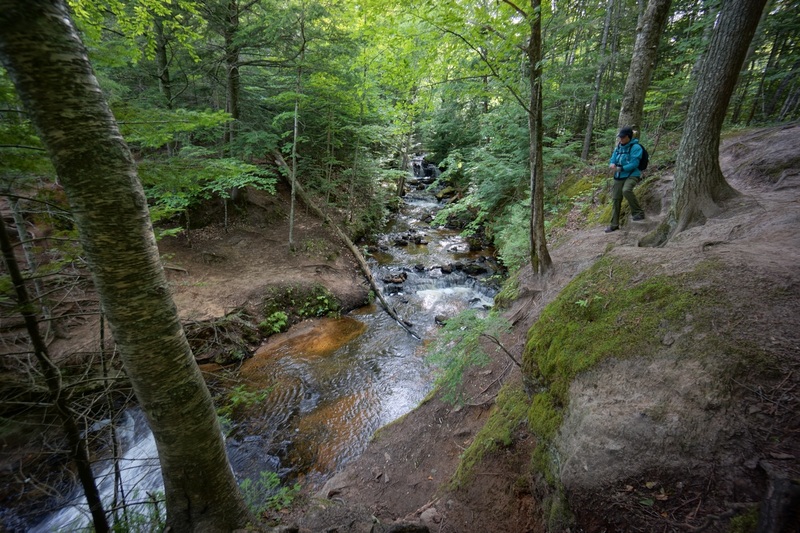 We realized that if we had taken another trail from Mosquito Beach, we could have avoided a point-a-d back scenario to the falls, but that’s exactly what we did. The falls were another .9 miles each way from the junction of the trail we were on, so we went for it. Had we come in on the other trail, slightly west of the one we took, we could have walked right past the falls on the way back to the car. Oh well! 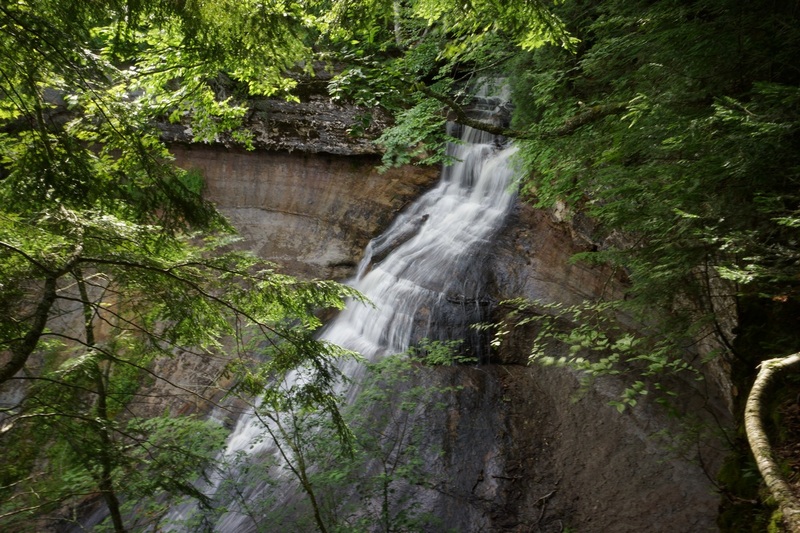 Mosquito Falls were only about 6-8 feet tall, but fairly wide in comparison to Chapel Falls. We didn’t stick around long as the thought of our post-hike meal was starting to rule our actions. Back at the junction of the Mosquito Falls trail and the trail we had taken from Mosquito Beach, it was only another half mile or so back to the trailhead. When we arrived at the trailhead, it was much more full than this morning. 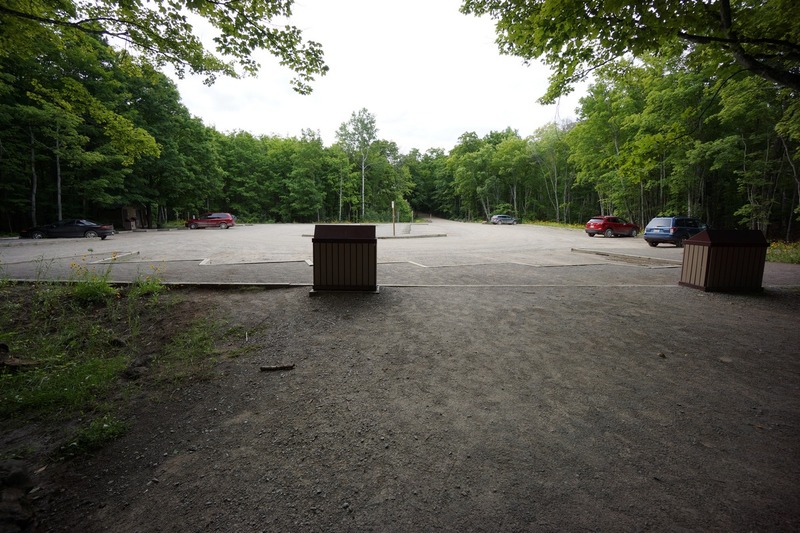 By the way the cars were parked alongside the road leading into the trailhead, it’s obvious it was much more full earlier today and that it had actually cleared out. We headed over to the Bear Trap restaurant (H-58 & H-15) for some food afterwards. It’s the only restaurant in the vicinity that I saw. Decent food, but it sure hit the spot after today hike of nearly 16 miles.